Asbestos containing ceiling texture was very popular prior to 1978 and it poses a real danger to you and your family’s health. As Metro Vancouver’s #1 ceiling experts, here at RemoveCeilingTexture.com, we test all ceilings built prior to 1982, before attempting to disturb or remove the ceiling popcorn texture. This testing is included at no cost to our clients as part of our ceiling texture removal service. Asbestos exists quite commonly in homes build prior to 1982, including in the ceiling popcorn texture. Although the use of asbestos in building materials was banned after 1978, it can still be found in many houses built after 1978. This is due to stock that was manufactured prior to 1978, but remained in stock and was sold over time. Do your ceilings contain ASBESTOS? Click here to get in touch with us! BUILDING INSPECTOR CLEARS UP MISCONCEPTIONS ABOUT ASBESTOS AND POPCORN CEILINGS A homeowner asked certified building inspector Barry Stone of California about asbestos in his popcorn ceiling. He did not realize that the ceiling texture in his home contained asbestos, and had removed it from two rooms without following asbestos safety procedures to prevent contamination. Instead, he scraped the dry ceilings and cleaned up the floor with a shop vacuum. After learning about the possible presence of asbestos in popcorn ceiling textures, the homeowner became concerned about the potential contamination of his home and the possible impact on his family’s health. In response, Stone helped clear up some common misconceptions about asbestos and popcorn ceilings. Valuable resources on asbestos removal. Valuable resources on asbestos testing. Has asbestos been banned in the U.S.? Many people believe that asbestos has been banned from all products being manufactured in the United States, but this is not the case. Although asbestos has been banned from many products, it can still be found in automotive brake linings and building products such as flooring materials and roofing mastics. In fact, in 2010, the U.S. imported approximately 810 metric tons of asbestos for commercial use , 90 percent of which came from Canada. Learn more on our Facebook group, Fight Mesothelioma | Mesothelioma News. When was asbestos banned for use in popcorn ceilings? Many people believe that asbestos was banned from use in popcorn ceiling texture in the 1970s. In fact, the manufacturing of popcorn ceiling asbestos texture was banned in 1978, but it was still legal to install it. Installation of asbestos ceiling texture was not banned because of the financial loss it would have meant for manufacturers, suppliers and contractors who had already purchased stock of the product. Asbestos ceiling texture was still being installed in homes through the 1980s when the product stocks finally ran out. How can I tell if my popcorn ceiling contains asbestos? Many people believe that asbestos can be identified based on the age or physical appearance of the popcorn ceiling texture. However, asbestos fibers are microscopic, and can really only be identified by a polarized light microscope. Stone recommends that anyone who wants to remove potentially asbestos-ridden popcorn ceiling texture should have it tested by a lab. Why should I be worried about asbestos exposure? Asbestos exposure has been linked to horrible asbestos diseases, including deadly asbestos cancers such as mesothelioma. Mesothelioma is a rare cancer of the lining of the lung that is caused by asbestos exposure. While many people who are exposed to asbestos, such as through popcorn ceilings and other building materials, never develop mesothelioma, there is no “safe” level of exposure to asbestos, so when removing popcorn ceiling textures or any or material in your home that may contain asbestos, it’s essential that you have it tested and, if necessary, properly removed. 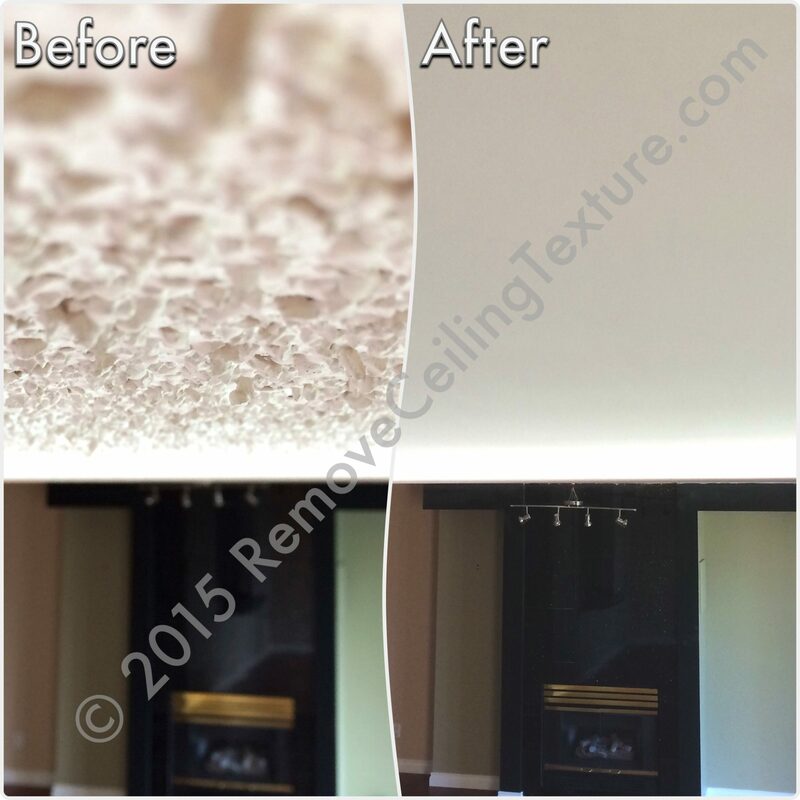 I removed some popcorn ceiling texture from my home. It may or may not have contained asbestos. Will I, or any of my family members, get an asbestos disease such as mesothelioma? Asbestos cancers don’t manifest until decades after exposure, so it’s impossible to tell right now if there will be long-term health effects. However, asbestos cancer diagnoses are very rare, so it is highly unlikely that you, or your family, will ever have to deal with these diseases.